Thank you for helping with the 41st St Louis Sunshine Luncheon! The Luncheon will take place on Thursday, May 16th. Make a Dish (Food should be dropped off at Reddington Hall between 7:45am - 9:30am Thursday morning) We will email you details regarding drop off and casserole recipe closer to the event. Desserts - No nuts or coconut please. Pies and cakes are the most popular. Need about 35 volunteers. Hang Wall Art Decorations - Help decorate the gym and tape paper decorations to the gym wall. Will be Tuesday, May 14th, at 11am. Will be about an hour or less. Set Up the Gym the day before - Arrive at Reddington Hall at 2:20pm. Help with details, last minute decorations, setting the tables, etc. Host/Hostesses - The Host/Hostess will be assigned a table to manage. They will help with hot beverages and answer questions the 5th grade servers may have. Kitchen Crew - Part of a 5 person team that assembles fruit salad, plates the dinners, helps 5th graders put plates on carts for service - generally help in the kitchen. Need 2 more helpers on Thursday 10am - about 12:30pm. 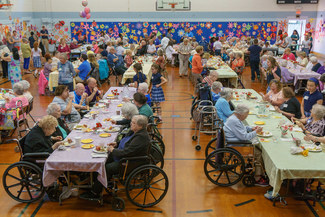 Escorts - Greeting guests and helping guests to their tables from the vans (pushing wheelchairs or just helping them find their way), helping them back to their vans at the end of the luncheon. Could you forward the recipe?